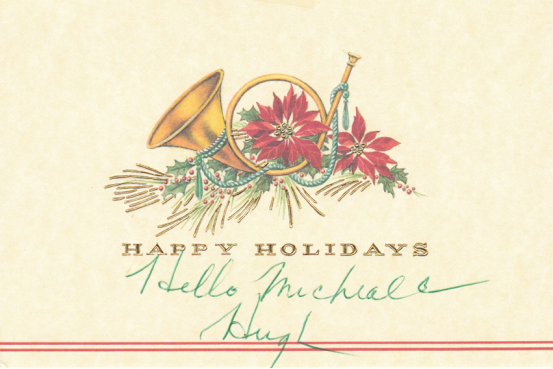 Holiday Greetings From Yesteryear — And Today! Before there were cell phones and instant messaging, before there was Twitter and Facebook, there was only the mailbox. It was through that little box that I kept in touch with friends who lived in other parts of the country and world. One of the best parts of the holiday season was going to the mailbox every afternoon in December to see if there were cheerful greetings coming my way. 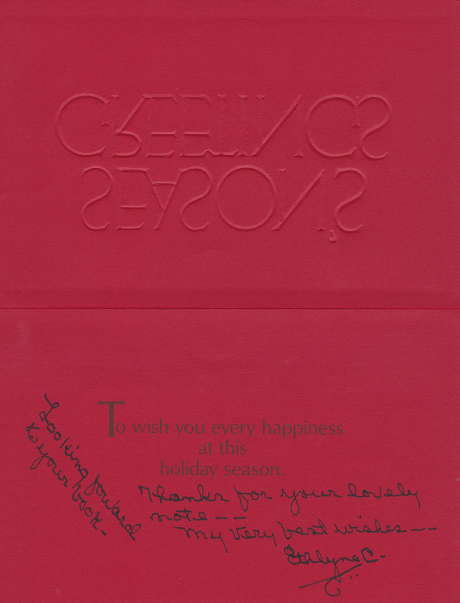 I loved to see the card they chose, the greetings they selected, the familiar handwriting. After I interviewed someone for my books or for my column in Classic Images, I wanted to stay in touch. That included Christmas cards. As the years passed, I received fewer and fewer holiday greetings from my silent film buddies. Sadly, there weren’t any cards in my mailbox this year from those who made their livings before the movie cameras in the 1910s and 20s. 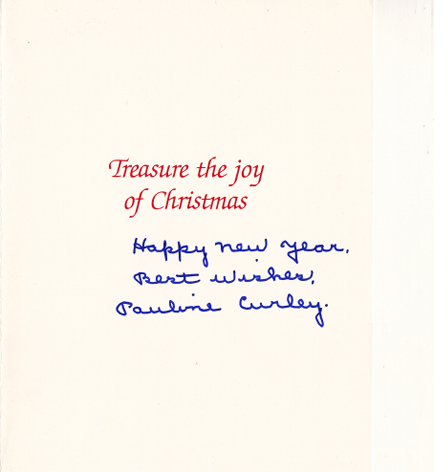 I suppose that my last Christmas greeting from someone in that era came from Dorothy Janis, who died a couple of years ago. I make it a practice every year to pull out my files and look through the cards from years passed. It fills me with nostalgia, but also a bit of sadness, realizing that the era that feel I connected to has passed into history. I want to show you some of my favorites. Oh! I saved a few surprises for the end. 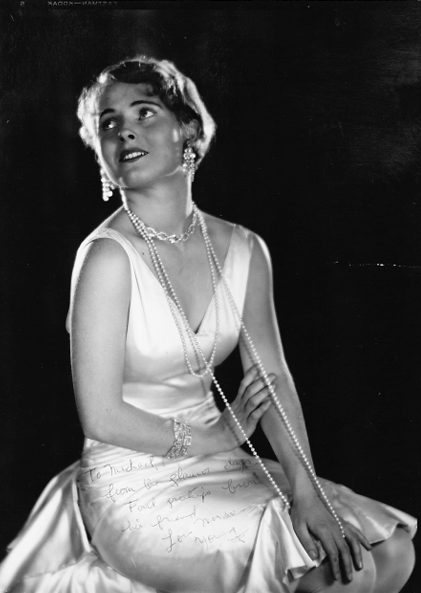 One of my favorite Esther Ralston photos. 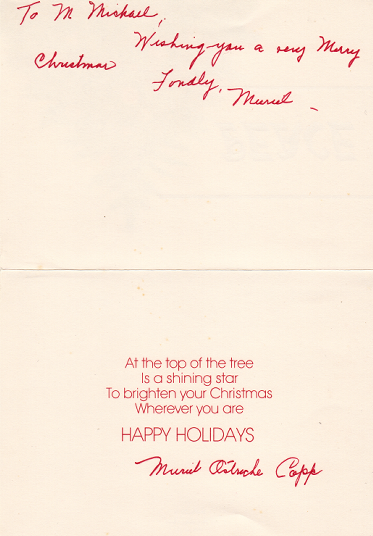 I didn’t have much correspondence with Muriel Ostriche after our interview in 1988 for my book, Broken Silence. She died in 1989. 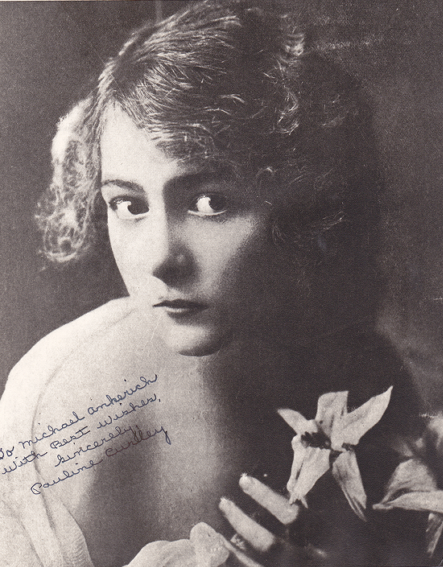 Hard to believe that Muriel Ostriche started her career in films in 1911, a hundred years ago! I made a trip to Memphis, Tennessee, in 1991, to spend the afternoon with Hugh Allan. What an interview! What a guy! 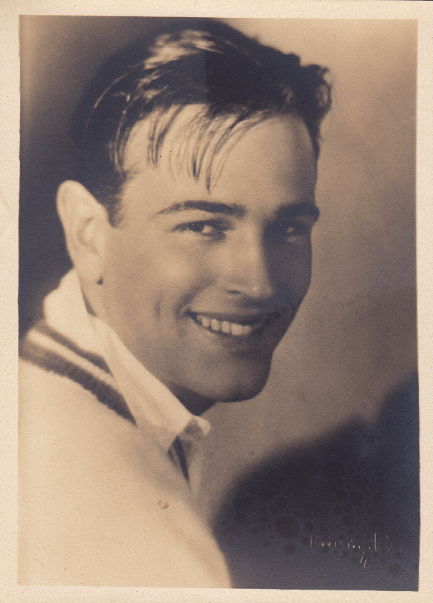 Hugh Allan, a handsome leading man of the mid to late 1920s. Read my interview with Pauline Curley in The Sound of Silence. Like Muriel, her career started in 1911! This was one of Pauline’s favorite portraits. You may remember I told you about the gorgeous Ethlyne Clair in a previous post (https://michaelgankerich.wordpress.com/2011/12/04/a-soon-to-be-groom-checks-out-past-hollywood-ceremonies/). I recounted her wedding to Ernest Westmore and the fiasco that happened on the steps of the church when the happy couple emerged from the ceremony only to find his previous wife and their child begging for money. 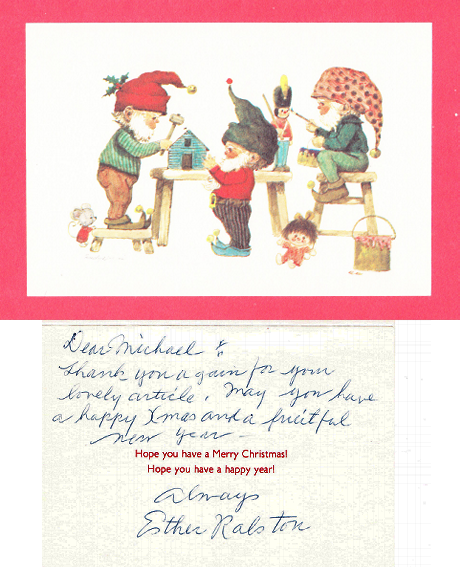 Ethlyne loved sending holiday greetings. She had a unique signature. The little curl at the bottom of her signature was an expression of love, she said. 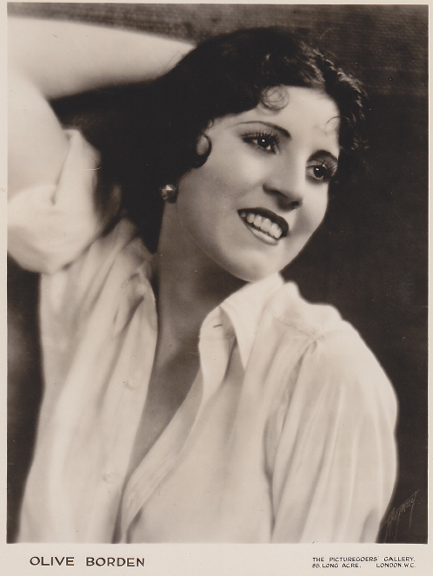 The ravishing Ethlyne Clair, who got her start in a Barbara La Marr film, hated playing in Westerns near the end of her career. Her idea of being a film star was playing the vamp. “I thought I was above all that (serials and Westerns). I wanted to do more than ride horses through the desert.” Want to know about her run-in with Louise Brooks? Check out Broken Silence. Her story is there. Ethlyne Clair, my idea of a vamp! Okay, I promised you a surprise at the end. Here it is, courtesy of Benjie Wood, perhaps the most avid Olive Borden fan there is. 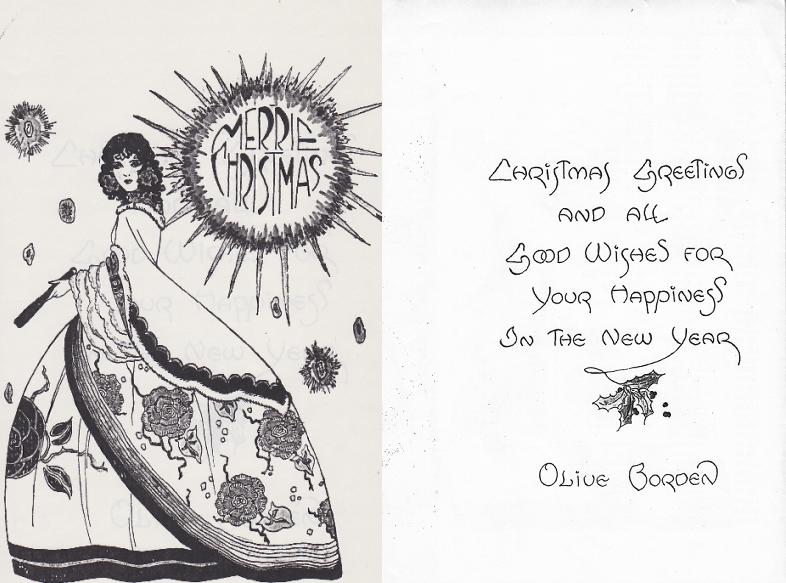 He treasures this 1927 Christmas card from the lady herself. 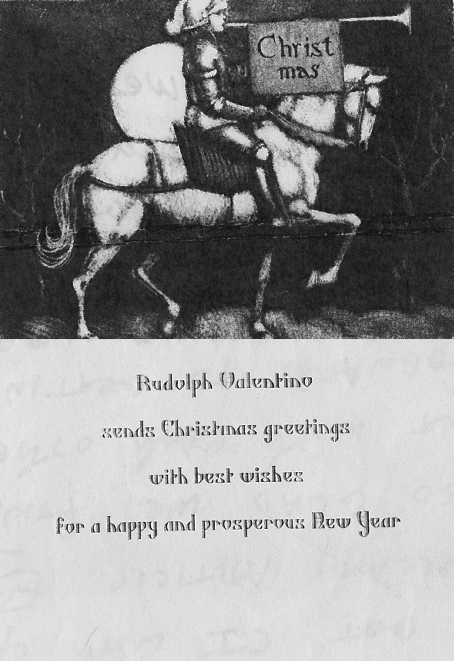 I would be remiss if I didn’t offer holiday cheer from the Sheik himself, Rudolph Valentino. Finally, I close with holiday greetings from Charlie and me. The Santa hats aren’t photoshopped. We took them thousands of miles in a suitcase just to put them on at the opportune moment. I couldn’t wait to get to the Sphinx to see the shadow where Theda Bara was born. Then, I happened to remember Eve Golden’s book that said Theda was no more born in the shadow of the Sphinx than I was! Anyway, I wish all of you the best holiday season ever and a year filled with peace, love, happiness, and prosperity. 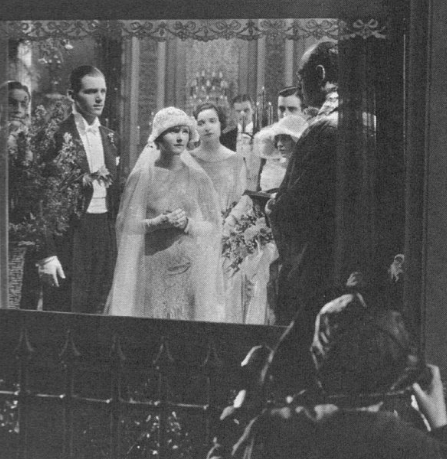 With my nuptials less than a week away, I have been daydreaming about the famous wedding scenes from Hollywood’s silent era. There were some spectacular occasions, social events of the season that I imagine myself being part of. The first one that came to mind was not a real marriage at all, but a celluloid union between Laurel and Richard. Laurel was Lois Moran; Richard is Douglas Fairbanks Jr. The film was Stella Dallas (1925), the tale of a struggling mother, Stella (Belle Bennett), who sacrifices everything for her daughter, Laurel. 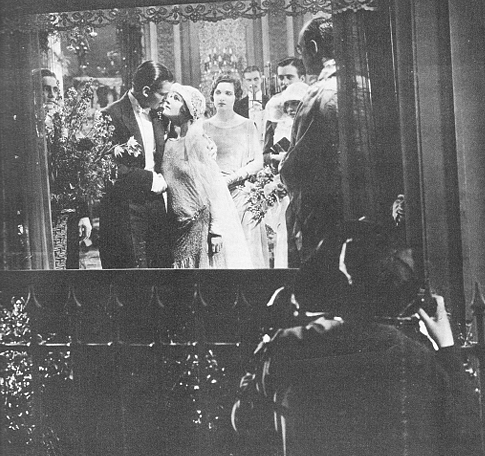 Who can forget the soapy ending with Stella watching the marriage through a window, as she is unable to identify herself without spoiling the event. A cop adds insult to injury when he approaches a rain-drenched Stella and asks her to move on. A tear jerker, for sure. I saw the picture, which I personally think is superior to the Barbara Stanwyck version, in the mid-1980s. I had interviewed Lois Moran for my book, Broken Silence, and we developed a correspondence that lasted until her death in 1990. During the course of our conversations, Lois mentioned she had a VHS copy of Stella Dallas, given to her by its director, Henry King. She generously offered to mail me the tape, so that I could see this classic story. It became one of my top five favorite silent films. I’ll tell you about the others in later posts. Not only did I keep the ink flowing between us, I also kept a steady flow of questions in motion. Lois in a 1987 snapshot. I was curious about her relationship with writer F. Scott Fitzgerald, for sure, but I was also very interested in her recollections about Stella Dallas and the famous wedding scene. 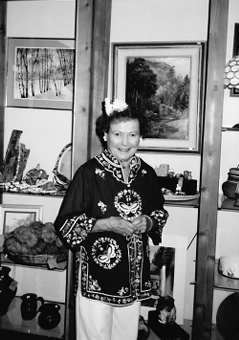 Belle Bennett, having just lost a son, was like a mother to Lois and Doug Jr. “She was an extraordinary woman with great charm, dignity, and warmth,” Lois said of Belle. 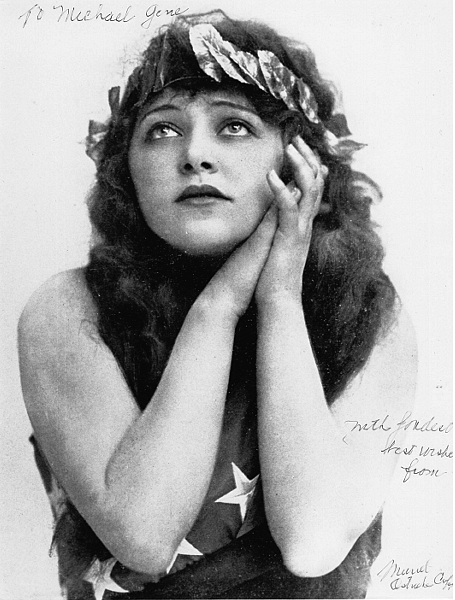 If I ever write a follow-up to Dangerous Curves, my book about the tragic lives of silent film actresses, I will include Belle Bennett. She had a difficult life that dealt her more than her fair share of disappointments. If you have not read Richard Buller’s fascinating biography of Lois Moran, you must! 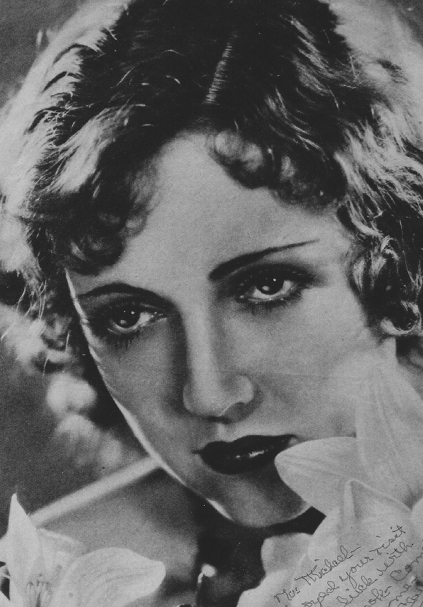 It is beautifully written and a fine tribute to a lovely actress of the silent screen. I digress! I was telling you about the daydreams I’ve been having about Hollywood marriages and how I imagine my own wedding in light of some of the most famous (infamous) weddings in early film history. 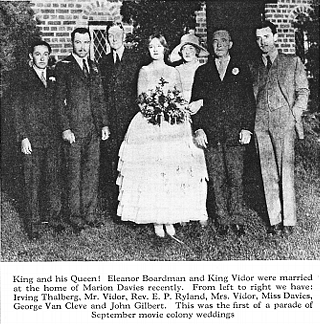 I certainly don’t want my nuptials to unfold like the 1926 marriage of director King Vidor to actress Eleanor Boardman at the home of Marion Davies. 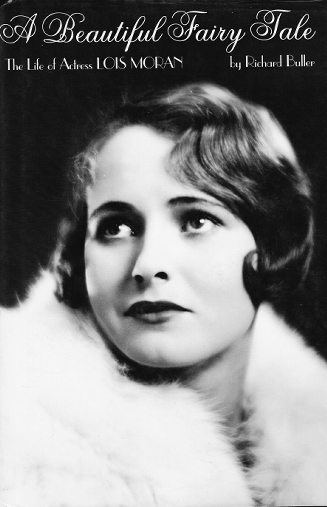 Eleanor told me, in an interview for Broken Silence, that the ceremony was supposed to have been a double wedding, that John Gilbert and Greta Garbo were to have been married in the same ceremony. The Vidor-Boardman wedding party. Too much drama for me! Garbo failed to show up and a heartbroken (and drunken) John Gilbert flattened his boss, Louis B. Mayer, into the bathroom floor when Mayer advised the movie idol to sleep with, not marry, the great Garbo. I’m not much for drama, so I’ll pass on this scenario. 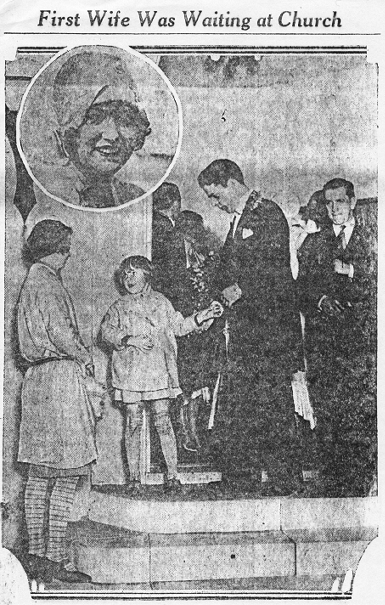 I could also put myself into the union of Rod La Rocque and Vilma Banky in 1927, said to be the social event of the year, but who could compete with the beauty of Banky, not to mention the dashing La Rocque? I would still love to have been present at that event to see whether they were as beautiful in person as they appeared in photographs. Oh, dear! Here we come to the Mae Murray and David Mdivani marriage in 1926. 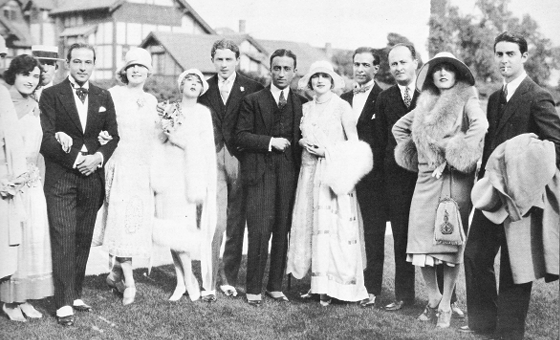 What an event this must have been, rubbing shoulders with film idols Pola Negri, Rudy Valentino, Agnes Ayres, and others. Although I am delighted that Mae’s granddaughter is coming to my big event next week, I can’t see myself in this marriage extravaganza. I could never get my body into that famous Mae Murray pose, nor could I look quite as needy as Prince Mdivani. Read the behind-the-scenes account of this famous pairing in my upcoming biography of Mae. My other favorite wedding story came from actress Ethlyne Clair, whose interview also appeared in Broken Silence. She married make-up artist Ernest Westmore in February 1930. They made a handsome couple, Ethlyne and Ern. 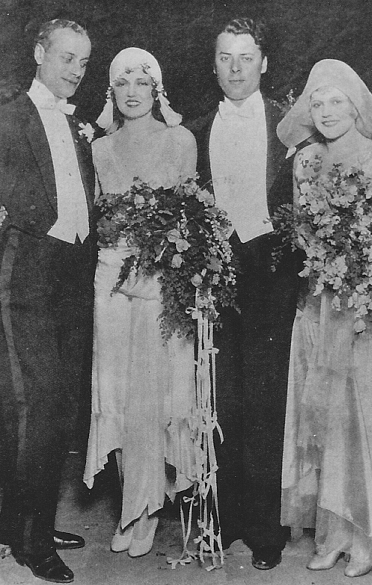 The happy couple, Ethlyne Clair (second from the left) and Ernest Westmore (second from the right), stands with actress Charlotte Merriam and actor John Davidson. They spoke their vows among their friends at Hollywood Presbyterian Church. 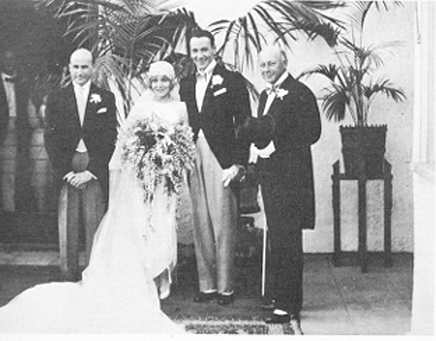 As the radiant bride and groom emerged from the church following the ceremony, Ernest’s first wife, Veoda, and their daughter, Muriel, were waiting on the church steps. Dressed in rags, the two stepped forward and disrupted the gay occasion with their pleas for some relief from their dire circumstances. Ethlyne Clair's wedding nightmare made headlines over the country. “Daddy, daddy, why don’t you pay mamma that money so I can go back to school?” his little daughter cried. A court server then stepped up and handed Ernest papers, which question why he was behind $1,200 on alimony payments to his family. It’s a bit difficult to see myself in the Westmore-Clair fiasco. I can’t envision anything like this happening at my wedding next week, as I don’t have any children running around (that I know of). When I think about my own special event coming up in a few days in Brooklyn, my mind wanders back to that peaceful and sweet scene in Stella Dallas where Laurel marries Richard. I like that one best of all. I do, however, hope for better weather than the rain they had on their wedding night. And, please, if we have any Stella Dallases hanging around outside in the rain, dry yourself off, come on in, and join the party!